Like all sewing projects, we will begin with fabric and supplies. I love this part of the project! Main Fabric: All versions of Sorbetto call for light- to medium-weight woven fabrics. Some appropriate options include quilting cotton, chambray, shirting, lawn, voile, double gauze, rayon challis, and of course, silk. 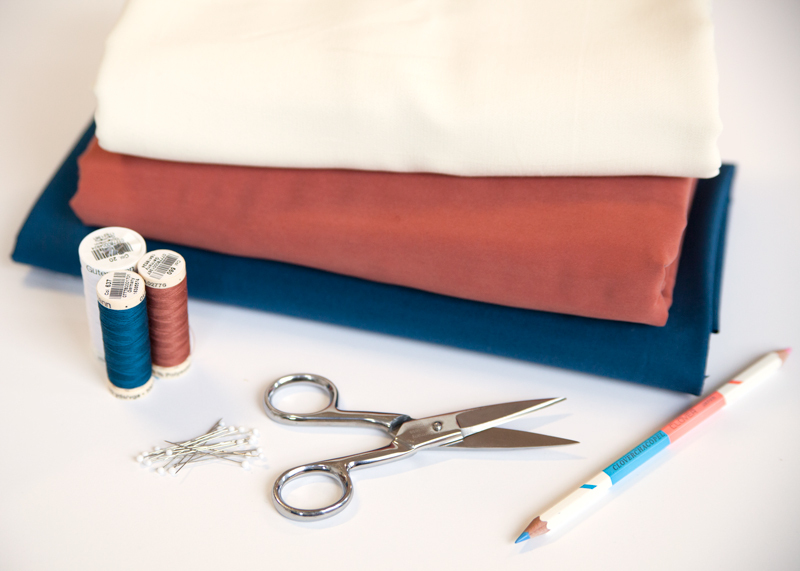 Bias Tape: You will also need 1/4” double fold bias tape to finish the necklines of all versions of Sorbetto, as well as the armholes of versions 1 and 2. I highly recommend making your own bias tape out of your main fabric. Pre-made bias tape is usually made from a blend of cotton and polyester and has a tendency to be very crisp. If you choose to use pre-made bias tape, be sure to pick a fabric that has a similar weight. Linen in lipstick pink from Stonemountain and Daughter Fabrics, $21.00/yard. Black bang quilting cotton from Fancy Tiger, $11.00/yard. Windowpane shirting from Harts Fabric, $9.99/yard. Constellation double gauze from The Cloth Pocket, $17.00/yard. Cobalt cotton batiste from Fabric.com, $6.98/yard. 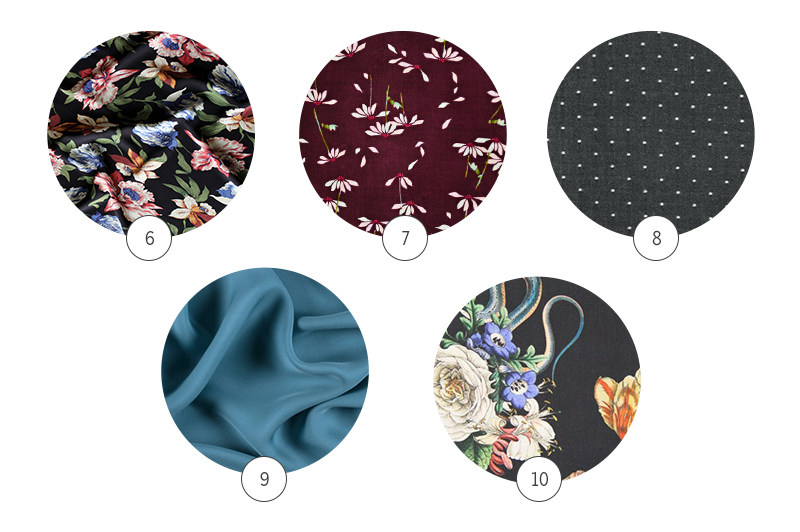 Floral viscose poplin from Blackbird Fabrics, $8.52/meter. Plum cotton voile from The Confident Stitch, $15.00/yard. Black polkadot chambray from Dragonfly Fabrics, £13.90/ meter. Cobra Corsage from Fabric Godmother, £15.00/meter. Colonial blue silk double georgette from Mood, $24.99/yard. Tape measure: Great fit starts with accurate measurements of your body. I prefer fiberglass tape measures as they do not stretch with use. Clear ruler: Use this for pattern adjustments, putting your pattern on grain, and marking your hem. French curve and hip curve: Depending on the fit adjustments you make, having a selection of curves is vital for redrawing curved lines. Fabric shears: Cut your fabric with shears or a rotary cutter. Pins: More pins = more control! Water soluble marking tool: Since we will be marking on both the right and wrong sides of our fabric, make sure that your marking tool is water soluble. Seam gauge: This tool is handy for taking small, repeated measurements. It is a great tool for hems and pleats. Machine needles: Choose a needle that is appropriate for your fabric. For medium-weight fabric, use a universal size 80/12. For lightweight fabrics, use a smaller needle, like a microtex 70/11. Prewash your fabric in the same way that you will wash the finished garment. I never skip this step. There are few things more disappointing than working hard on a project only to have it shrink or bleed the first time you wash it. If you choose a fabric that is prone to shrinking, like rayon, be sure to buy additional fabric to compensate for shrinkage. Next we will cover basic fit adjustments. Printing the pattern this week. Can’t wait to get started…off to launder my fabric! What fabrics will be used by the instructors for during the Sewalong (shown in the first pictures of this post)? Also, are these the same fabrics that are used in the example versions? 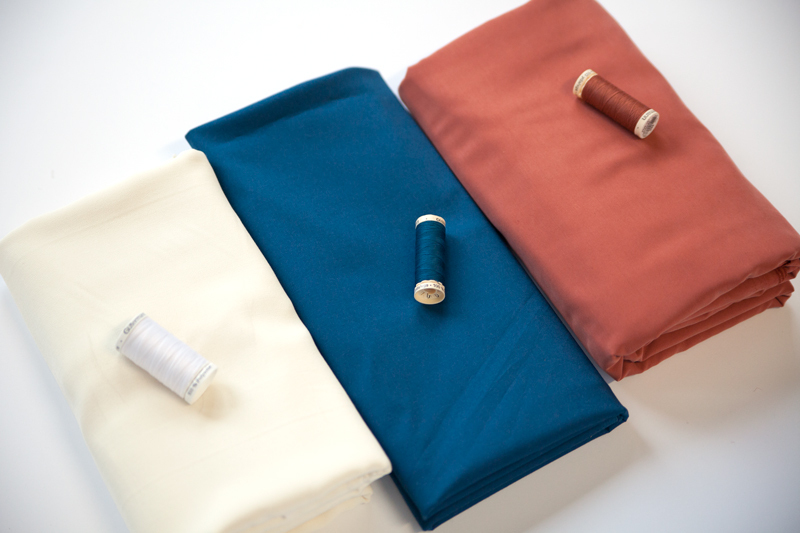 Hi Julie, the off white fabric is a rayon crepe, the orange is a brushed tencel, and the blue is a cotton lawn. These are different from the fabrics used in the photo samples you see on our site now. The orange has a lovely sheen. Do you have any recommendations on where to buy this fabric or something similar? I found that fabric locally, it is definitely unique. I think your best bet would probably be somewhere like Mood. I found some cotton/tencel brushed flannels, they are a little different but still have that nice sheen. I guess I’ll be digging into my fabric stash in hopes of finding something that will work! I want to make my own bias tape. Would 1/2 yd additional fabric be enough? Thanks. Hi Patty, that is a great question. An additional 1/2 yard should be perfect! Sorry, I found it now on the Details page! I have never used a PDF file for patterns. 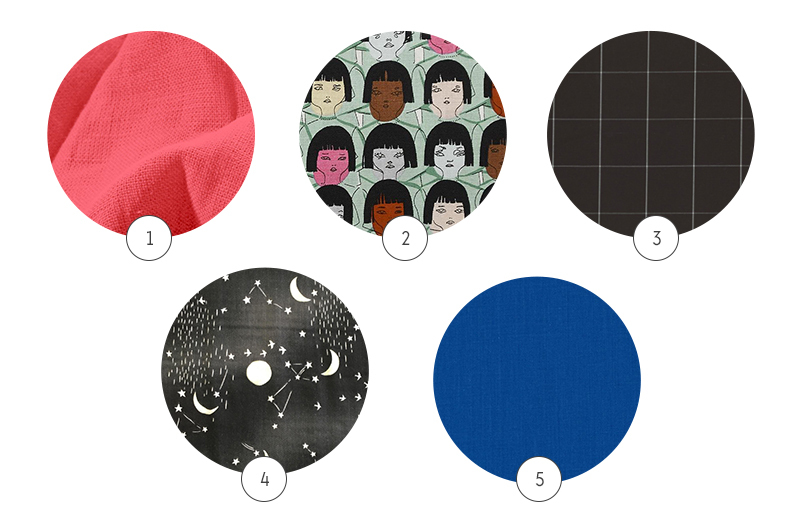 Do you have tips for printing the pattern? If I go ti Kinkos, will they understand what I want to do? :) Any advice would be greatly appreciated. Hi Tracy, I am happy to help. Kinkos should be able to print this pattern no problem. The most important thing is that scaling is set to “100%”. This is true whether you would like them to print the wide format version or the tiled version. I ran into an issue with Kinkos. They will not assist me in printing the pattern, unless I have copyright approval from Colette Patterns. How do I obtain this approval? Hi Tracy, I am sorry you ran into that issue. You can send them this link. It should serve as adequate permission. 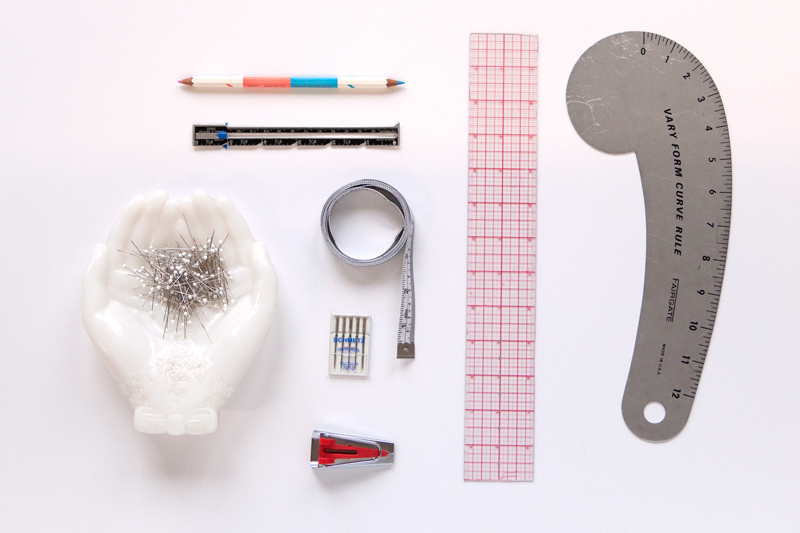 Is the hip curve ruler a necessity? I don’t own one and wasn’t sure if I needed one to participate in the sewalong! Hi Jenn! You can absolutely participate without a hip curve. Hip curves help you create long smooth curves and are really helpful when executing pattern adjustments. Thank you so much for the quick response. I am new to the curves so I am not sure if this is what I need? I would say that the two most important curved rulers to invest in are a French curve and a hip curve. French curves are ideal for creating smaller curves like armholes and necklines, while hip curves are ideal for drawing long curved lines like hips and side seams. And I LOVE the pin holder! So lovely! Isn’t it cute?! Like a little pair of helping hands in the sewing room. If only they could cut and tape the pdf for me! Haley, would crepe or georgette be too light for Sorbetto? I am a little concerned about making bias out of such soft fabric, but it would feel so fresh made up into such a cute top! Would love to hear your thoughts about that, and thank you! Hi Ledys, a crepe or georgette would be a great choice for Sorbetto. Just make sure to staystitch the neckline and armholes immediately after cutting to prevent stretching. You can try using a spray stabilizer when creating your bias finish, this will lend some temporary structure while you fold and sew.